Spend your Sunday creating your own DIY printing stamps that showcase your own symbols of rebellion! 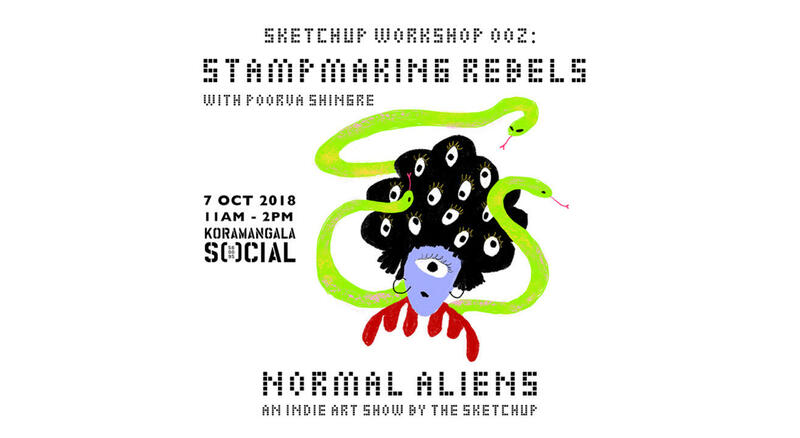 This 3 hour workshop starts with a lino cut demonstration by Poorva Shingre, an illustrator and graphic designer based in Mumbai, who has conducted workshops across the country over the past few years. An integral part of the illustration and art scene, Poorva will be happy to tell you stories of her experiences as a graphic designer in Mumbai and chat about her favourite self initiated projects, as she guides you through the meditative and cathartic process of stamp making. We close the workshop by making prints of your stamps on newsprint and other cool papers that Poorva will bring along. By the end of the workshop, you will get the hang of the process, how each tool works and which is most comfortable for your use. Once you are familiar with these concepts, there’s no stopping you from what you can create. Go stamp crazy! Basic carving tools, Lino sheet. Some cool papers to try out patterns with the stamps carved by everyone. Everything else that you will require to create your own stamps. Poorva Shingre is an illustrator/ Graphic designer from Sir J.J institute of applied arts. Works from her home studio in Mumbai. Loves experimenting with different mediums, hand lettering and linocut printing. Has worked on brands like Taj Vivanta, Dunkin Donuts, Lodha and NH7 Weekender. She currently is exploring the medium of print making (lino cut printing). The Sketchup is an illustrators group organised by Madhuvanthi Mohan (illustrator at Something Sketchy) that aims to create a network and platform for illustrators in the country to connect, collaborate and support one another.